At 5.31pm this evening I received a reply from Apple’s Photo Services team concerning my defective Photo Book. They have refunded the cost of the book to my credit card (minus postage costs) and apologised for the inconvenience. If I want to place the order again I need to contact them within 48 hours. That’s a fast and decisive response that I can’t complain about, but it leaves me puzzled. I asked for a replacement book if the problems could be fixed or a refund if not, and got a refund. Does this mean the colour issue is not something that can be changed? In what I have found to be typical Apple behaviour they have resolved the problem without admitting it exists. I had exactly the same response when my Macbook suffered the sudden shutdown issue, and again when the battery lost capacity. I’m not going to order another book if I can’t be sure the quality is as good as it should be. Looks like the search for an alternative Photo Book supplier starts here. I wrote recently about my problems with my aging Cable modem and Virgin Media’s email response. It’s now 15 days since the email arrived, so by Virgin’s advice I should be getting the replacement modem some time in the next 13 days. My connection continues to drag it’s heels and fall over if I look at it funny. Does this work the other way round? I was wondering if I could tell Virgin to allow up to 28 days for my next bill to be paid. I recently ordered some books from Apple through iPhoto, one hardcover and three softcover books. They contained my wedding photo’s, the hardcover for myself and Mrs Basshead, the softcovers for family members. The books arrived yesterday and there’s a problem or two. The images in the softcover book appear to have had their saturation boosted, but still look acceptable. The Hardcover book is pretty horrible though. Saturation has been boosted to the point where skin tones are unnatural and most shadow detail has been lost. I use an EyeOne Display screen colour calibrator so I know the colours in iPhoto were accurate. The other problem is the text on the inside rear flap. I listed the wedding guests, and their names are garbled with letters printed on top of each other and unwanted spaces. This all came as a big surprise to me as I have ordered Apple books before and been impressed with the results. The last book I ordered was for my father-in-law’s seventieth birthday. I scanned fifty years of family photo’s for that album, it looked great and he was very impressed. I called Apple support this morning and after around 30 seconds my call was answered by a helpful lady who emailed me the support link for Apple’s Photo Services Team. I detailed the issues and was told onscreen that they strive to answer all support emails within 24 hours. You’re offered a replacement or refund if not satisfied with your book, so I’ve asked for a replacement if the problems can be fixed or a refund if they can’t. I’ll post again when they get back to me. I’ve always thought you can’t judge a company until you see how they deal with problems. Apple have been a bit hit and miss in my past contact with them, so here’s their chance to shine. Starting February 1st, O2 has changed its UK iPhone plans. The £35 a month for 200 minutes and 200 texts is the same price, but now offers 600 minutes and 500 texts. The £45 plan now has 1200 minutes up from 600, still with 500 texts. Customers paying £55 a month can drop to the £45 tariff and get the same package, or go to a new £75 per month plan with 3000 minutes and a rather unimpressive 500 texts. All packages still feature unlimited data and access to O2 wireless hotspots. No reasons given for the changes, so make your own mind up if it’s to boost lower than expected iPhone UK sales or just sweeten the deal. I though I would upload a few Apple themed wallpapers for the iPhone/iPod touch this week, so here’s the first one. 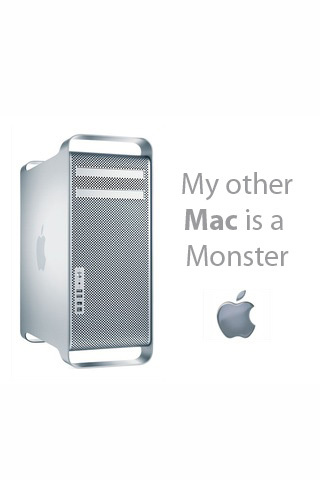 In the spirit of all those crappy ‘my other car’s a Ferrari’ stickers, this one’s for those suffering Mac Pro envy. I’ve also uploaded a simple template for anyone wanting to make their own, see the wallpapers page to download it. It seems there’s a bug in the 1.1.3 Mail.app that stops it saving account passwords. 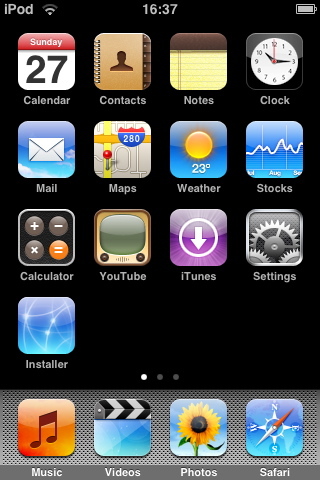 I installed a fix through Installer this morning, from the ‘iPhone 1.1.3 Apps for iTouch’ category. Not 100% sure, but I think this comes from http://applerepo.com, so try adding that as a source in Installer. iJailbreak also has some info on this and another source, sleepers.net/iphonerepo.